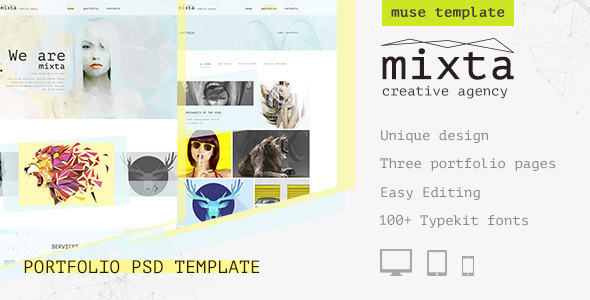 Adobe Muse Templates are best responsive themes of 2015. Suit premium portfolio, modern, parallax, photographers, creatives. Buy and freely download them with some clicks. You are just some steps away from your next great online project. Reckon is an single page scrolling parallax adobe muse template and it has a lot of additional features. 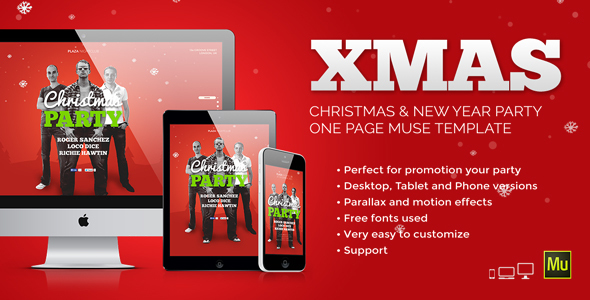 XMas is the onepage website template with motion and parallax effects created for promote your Christmas / New Year / Winter dance event, club party or festival. You can easy create your own promo site without writing a code using Adobe Muse and this template. Mixta is a modern and clean Adobe Muse template designed for creative people, who need to quickly and beautifully to present their works. It is great for photographers, designers, developers, design agency & studio or whatever you want.